Relax in this eco-friendly, old fashioned Amish Poly Outdoor Rocking Chair. Purchase a set of these Amish Poly Outdoor Rocking Chairs today! This Amish poly outdoor rocking chair is very comfortable and a perfect item for the front porch. Order a solid poly color or create a fun two tone look by selecting two colors. This poly rocker has the look of a hickory rocker but it is actually proudly made in America from recycled poly which is actually milk jugs! The Amish Poly Outdoor Rocking Chair is the eco-friendly, maintenance-free choice in outdoor furniture. This Poly rocking chair will not chip, crack, rot, or develop mold. It will also requires no maintenance like painting or replacing pieces. Just clean the poly rocker with soap and water. All-purpose cleaners or bleach and water solutions take care of extreme cleaning needs for your poly outdoor furniture. 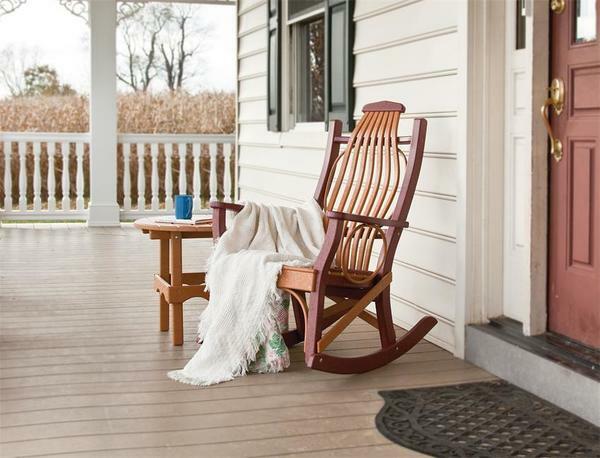 This porch rocker is built by skilled Amish woodworkers who make high quality outdoor furniture, no matter what material they use. The back parts of this rocker are steamed bent to added comfort. Enjoy years of carefree use with the Recycled Porch Rocker. Purchase a set of these Amish Poly Outdoor Rocking Chairs today! This Amish poly outdoor rocking chair is very comfortable and a perfect item for the front porch. If you are looking for a glider instead or a rocking then consider our popular Amish Poly Curve Back Swivel Porch Glider Chair or the Amish Made Adirondack 4' Fan Back Poly Glider Bench that is built for two! No Splinters,Splitting,or Cracking - always smooth to the touch! Our polywood porch rockers are beautiful! We love them! They arrived in great condition! Thank you for the wonderful service and the beautiful polywood patio furniture! We put it out on the deck beside our pond in the back yard. It is now our perfect little eco-retreat. Laura especially loves the rocker. We're happy we went with the polywood rather than wood. It's very heavy and sturdy. Thanks again!